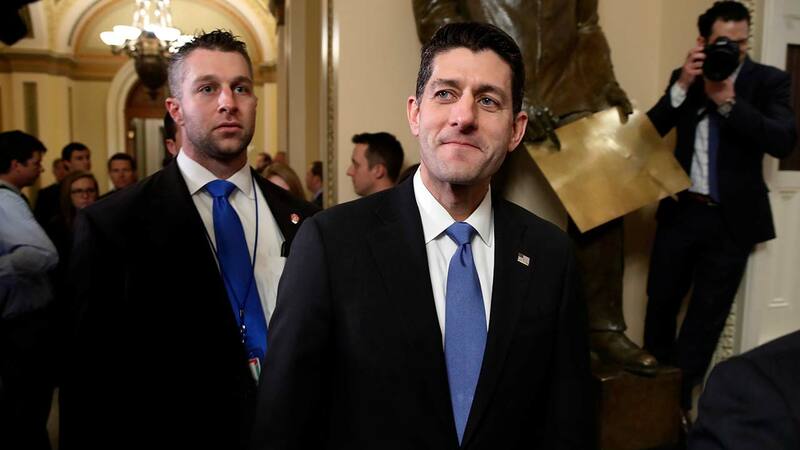 WASHINGTON -- WASHINGTON (AP) - Congressional Republicans delivered an epic overhaul of U.S. tax laws to President Donald Trump on Wednesday, bringing generous tax cuts for corporations and the wealthiest Americans while providing smaller cuts for middle- and low-income families. In a re-vote due to a last-minute hiccup, the House passed the massive $1.5 trillion tax package that affects everyone's taxes but is dominated by breaks for business and higher earners. Democrats call the legislation a boon to the rich that leaves middle-class and working Americans behind. The vote was 224-201 and came hours after the Senate's early morning passage along party-lines. It is the first major overhaul of the nation's tax laws since 1986. On Twitter and in White House remarks, Trump hailed the outcome, his own efforts and the work of GOP allies, including Majority Leader Mitch McConnell of Kentucky, who had drawn the president's wrath for the Senate's inability this past summer to dismantle the health care law. "Our team will go onto many more VICTORIES!" Trump tweeted. Congressional Republicans have cast the bill as a blessing for the middle class, an argument they will stress in their drive to hold onto their congressional majorities in next year's midterm elections. But one comment by Trump could complicate their messaging. "That's probably the biggest factor in our plan," the president said at the White House. Within minutes, during House debate at the other end of Pennsylvania Avenue, Rep. Richard Neal, D-Mass., jumped on Trump's remarks, calling it proof that Republicans were never interested in passing meaningful tax cuts for the middle class. The Senate used a post-midnight vote Wednesday morning to approve the measure on a party-line 51-48 tally. Protesters interrupted with chants of, "Kill the bill, don't kill us" and Vice President Mike Pence repeatedly called for order. Upon passage, Republicans cheered, with Treasury Secretary Steve Mnuchin among them. "If we can't sell this to the American people, we ought to go into another line of work," he said. "People have been hit by the media and the Democrats on their TV screen that everyone is getting a big tax increase, and that's just not the case," Ryan said Wednesday on ABC's "Good Morning America." But if the cuts for individuals are allowed to expire, most Americans - those making less than $75,000 - would see tax increases in 2027, according to congressional estimates. Despite Republican talk of spending discipline, the bill is projected to push the huge national debt ever higher. Trump is aching for a big political victory after 11 months of legislative failures and nonstarters. The president tweeted his congratulations to GOP leaders and to "all great House Republicans who voted in favor of cutting your taxes!" Congressional Republicans, who faltered badly in trying to dismantle Barack Obama's Affordable Care Act, see passage of the tax bill as crucial to proving to Americans they can govern - and imperative for holding onto House and Senate majorities in next year's midterm elections. "The proof will be in the paychecks," Sen. Rob Portman, R-Ohio, said during the Senate's nighttime debate. "This is real tax relief, and it's needed." "We believe you are messing up America," New York Sen. Chuck Schumer told Republicans, chiding them for not listening to his remarks. The legislation repeals an important part of the 2010 health care law - the requirement that all Americans carry health insurance or face a penalty - as the GOP looks to unravel the law it failed to repeal and replace this past summer. It also allows oil drilling in the Arctic National Wildlife Refuge. The bill is projected to add $1.46 trillion to the nation's debt over a decade. GOP lawmakers say they expect a future Congress to continue the tax cuts so they won't expire. That would drive up deficits even further. Associated Press writers Matthew Daly, Kevin Freking and Alan Fram contributed to this report.